Mansfield & Fagan were Isaac Mansfield (ca.1845-?) and Lawrence Fagan (1851-1921). Lawrence Fagan was described as follows in American Biography: A New Cyclopedia, Vol. 9, 1921, "Lawrence Fagan was born in Dublin, Ireland, January 1, 1851. As a youth of seventeen years he came to the United States, and in New York City's public schools completed his education, which had been begun in the schools of his native land and England. His first employment was in an iron foundry in Jersey City, and later, although still in early manhood, he entered the employ of Messrs. Mansfield & Scudder, who conducted an iron foundry on Willow avenue, between Sixth and Seventh streets, Hoboken. Upon the death of the former member of the firm, Mr. Fagan was admitted as a partner in the concern, which was known as Mansfield & Fagan. Their establishment was moved from the Willow avenue location to Third and Jefferson streets, Hoboken, and here operations were continued until 1891, when the firm was dissolved by Mr. Fagan's purchase of his partner's interests. It was succeeded by the Fagan Iron Works, and later the main plant was moved to Fourteenth street, Jersey City, the Hoboken foundry being operated as a branch. There was built up one of the largest structural steel and iron works in the East, the organization dominated, even when extensive public and private interests claimed much of his attention, by the forceful, energetic personality of Mr. Fagan. "Lawrence Fagan married (first) Hannah McHale, of Hoboken, New Jersey; (second), in September, 1891, Mary A. Foley, daughter of Michael and Catherine (Coughlin) Foley, her father a builder and contractor. Children of first marriage: Katherine, married Joseph Kahrs; John J., married Elizabeth Heitemeyer. Of second marriage; Marion, married George Parker Toms, of St. Louis; Madeline Marie; Arthur Lawrence, a graduate of Princeton University, class of 1921. Lawrence Fagan died at his Hoboken home, May 9, 1921..."
An obituary for Lawrence Fagan in the New York Tribune, 10 May 1921, p. 9, read in part, "Lawrence Fagan, formerly Mayor of Hoboken, died shortly before noon yesterday at his home at Tenth and Hudson streets, Hoboken, having been ill with stomach trouble since Friday. He was proprietor of the Fagan Iron Works of Jersey City, part owner of The Hudson Observer, and was reputed to be worth $5,000,000. Mr. Fagan entered politics in 1889 and seved for two terms in the New Jersey State Legislature. He was Mayor of Hoboken for four terms, from 1893 to 1902, and was the dominant influence in the Democratic organization of that city from the time he first ran for Mayor until his death." This obituary for Lawrence Fagan appeared in the journal, Iron Age, 12 May 1921, "Lawrence Fagan, owner of the Fagan Iron Works, Jersey City, N. J., died at his home in Hoboken on May 9 of stomach trouble. From 1893 to 1902 he was mayor of Hoboken. He was born in Ireland 70 years ago and came to this country when a boy. He became a blacksmith in Jersey City. Later he went into partnership with the late Isaac Mansfield in the foundry business. Eventually he bought out Mr. Mansfield's interests. John J. Fagan, a son, is now manager of the Fagan Iron Works. About 28 years ago with other men he founded the Hoboken Observer, now known as the Hudson Observer." Unlike Lawrence Fagan, information on Isaac Mansfield is sparse. He is very probably the Ike Mansfield in the 1870 U. S. Census who lived in Hoboken's 3rd Ward. Ike was 25 years old, born in New York, and employed in "Iron Railings." His wife was Jane, age 24, born Ireland. He might also be Isaac Mansfield in 1860, age 15, "Blacksmith," who lived with his mother, Catherine Mansfield, age 40, born Ireland, "Tailoress." They also lived in Hoboken's 3rd Ward. Mansfield probably died in the 1890s. A Jane Mansfield age 54, born August, 1845, in Ireland, who lived in North Bergen, New Jersey, in 1900, was possibly his widow. Mansfield & Fagan were described in the following terms in Quarter-Century's Progress of New Jersey's Leading Manufacturing Centers, 1887, "Architectural Iron Works, Store Fronts, Girders, Columns, Beams, and all kinds of Building Castings, Mansfield & Fagan, Proprietors, Jefferson, Third and Fourth Streets. - The widely known and progressive firm of Messrs. Mansfield & Fagan was established in 1872 by the present proprietors, Messrs. Isaac Mansfield and Lawrence Fagan, both of whom bring great practical experience to bear, coupled with an intimate knowledge of the industry and the requirements of builders and contractors. The premises occupied comprise a spacious four-story building, having a frontage of 325 feet by a depth of 100 feet... Sixty experienced workmen are employed and the machinery is driven by a fifty-horse power steam engine. Messrs. Mansfield & Fagan manufacture largely store fronts, girders, columns, beams, door lintels, window lintels and sills, and also all kinds of building castings, iron railings, and iron work in general... Messrs. Mansfield & Fagan have latterly furnished all the iron work for the City Hall, Hoboken; Snake Hill Almshouse, Lorrillard's factories, etc..."
Mansfield and Fagan were in business together as iron founders in Hoboken, New Jersey, in 1879. At that time the foundry was located at 238 Willow St., Hoboken, and both men lived at 37 Park Ave., Hoboken. Both also appear in the 1880 U. S. Census, living at 325 Park Ave., Hoboken. Mansfield was 35 years old and born in New York. Fagan was 30 years old and born in Ireland. Mansfield withdrew from the business in the early 1890s. Lawrence Fagan was recorded in the 1900 U. S. Census living on Hudson St., Hoboken. The census says he was born in Ireland, Jan. 1851, and that he immigrated to the U. S. in 1852. Boyd's Jersey City Directory, 1897 and 1898, indicates that Lawrence Fagan served as mayor of Hoboken during those years. City directories and the telephone directory in 1893-94 record the Fagan Iron works as successor to Mansfield & Fagan. At that time the foundry was located at 301 Jefferson St., Hoboken. In 1902 The Foundry, vol. 20, no. 116, April, 1902, announced, "The Fagan Iron Works, of Hoboken, N. J., will in a few weeks be removed to Jersey City, N. J., where a well equipped new foundry has been built, which will accommodate about forty molders. Architectural work will be made a specialty." According to Corporations of New Jersey Fagan Iron Works were incorporated 4 June 1891 and were in business until 29 May 1941. Photographs at the Library of Congress of the Jackson Street Bridge (1897-98), spanning the Passaic River in Newark, New Jersey, are accompanied by a description including, "The Jackson Street Bridge was constructed in the area of the Morris Canal ... by Fagan Iron works whose founder, Lawrence Fagan, was a prominent and influential businessman and politician." 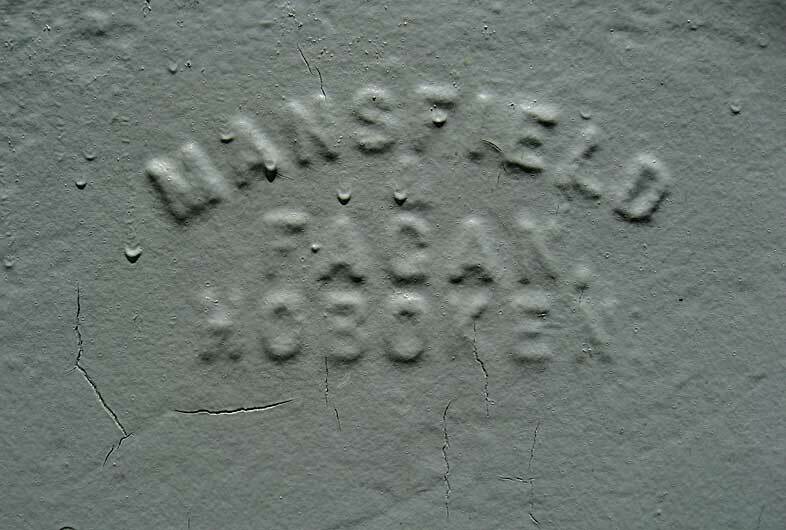 Foundry marks for Mansfield & Fagan abound in Hoboken. This example is but one of many. There are also marks for Fagan Iron works. This example is located at 159 Newark St.
Coal chute covers manufactured by Mansfield & Fagan and by Fagan Iron Works are found on their manholes page. The New York City Landmarks Preservation Commission's Tribeca East Historic District Designation Report, 8 Dec. 1992, includes the following on 12 White St., "The first story retains its original cast-iron storefront framing of stylized classical pilasters and a cornice; the western pilaster has an inscribed foundry mark reading 'Mansfield & Fagan, Hoboken.'"